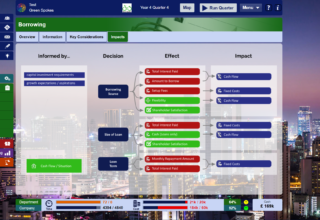 SimVenture Evolution, our groundbreaking on-line business strategy game, has been specifically designed to fast-track learning within corporate training and education learning environments. 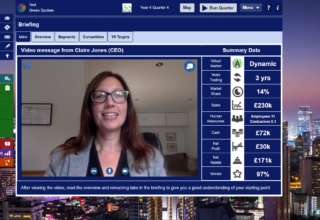 People use Evolution to start-up and/or scale-up a virtual simulated company and learn about business, management, finance and entrepreneurial leadership. 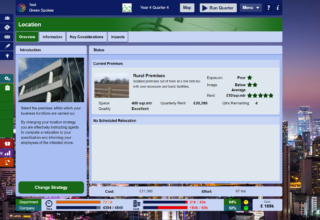 See for yourself, how the business simulator works and what it might do for you. 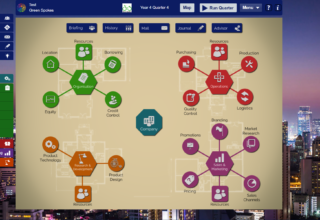 If you seek a powerful business strategy simulation or business strategy game, you’ll enjoy this gamified learning solution. 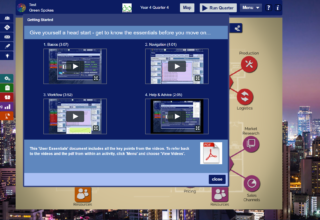 Packed with a range of advanced features, the on-line learning simulator allows users to start, manage and/or grow an SME and deal with virtually all decisions and issues company owners face. Evolution was designed with 10 partner education institutions and thus dovetails easily into many business school modules at all levels. The simulation takes the traditional static case study learning method and progresses it to a multi-dimensional environment that involves and engages students in meaningful and deeper learning. And for students using the Business Model Canvas or business planning templates, the simulation provides an opportunity to apply thinking and understand how theory works in practice. Corporate trainers use the simulation in many ways to develop commercial awareness, team-building, consultancy and problem-solving skills. Since Evolution is an on-line resource, individuals can work individually or in teams and receive remote trainer guidance and assessment, rather than spend unnecessary time and money traveling to a single training location. Packed with a range of advanced features, users run a virtual company for up to ten simulated years in quarters. Tutors and trainers can simultaneously set tasks, monitor progress, communicate and even assess work – in-class or remotely. Tools within the business game allow people to make extensive notes and record progress; at the same time facilitators have the power to start and stop any activity and interact with learners. 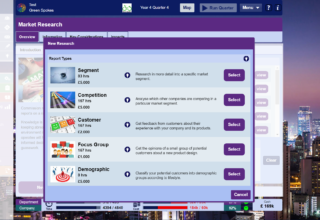 The resource also allows people to construct business plans and complete business planning tasks that support work with real-world businesses. 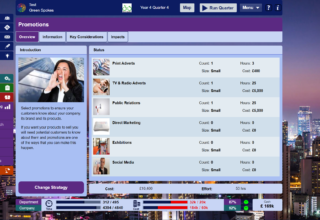 SimVenture Evolution allows people to deal with virtually all aspects of business. People can be given specific scenarios, which run in specific time-frames and focus on key aspects of business, such as finance, marketing or operations. 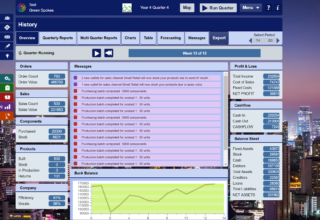 The on-line business simulation also allows people to compete against the markets within the simulation or go head-to-head with others. This depth of functionality heightens levels of engagement and sustained, authentic learning. All SimVenture Evolution clients are supported by an individual from the company’s Learning and Development Team. This expert and personal support is provided to help ensure you make the very most of the business simulation, from learning programme design through to implementation and delivery. Having direct access to a member of the team also means you’ll be signposted to an array of relevant supporting materials, available in game and on this website. 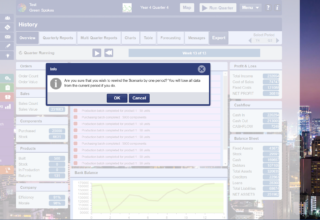 SimVenture Evolution comes complete with support information and a range of ‘Help’ functions provided in different formats. 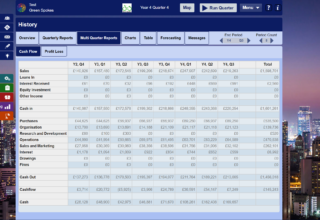 The inclusion of explanatory notes ensures people are able to get to grips with the business simulator quickly. As a company, we also provide free education and free corporate training and resource materials on this site. As a ‘Serious game’ Evolution can be used intensively over 2 to 4 hours or at intervals over a number of weeks or even months. This flexibility means the learning solution can easily be included with business management, leadership or entrepreneurship course or programmes. 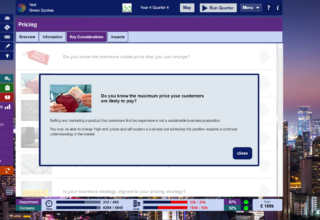 But before making a decision to purchase SimVenture Evolution, ask for your own free education or corporate evaluation copy of the business simulation game. 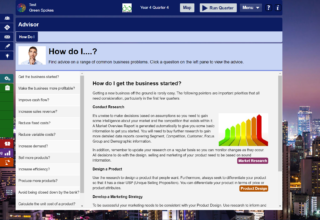 You can review the learning solution for up to 3 months and also request a live on-line demonstration should you have any further queries.